This past February was the 5-year anniversary of our moving back into the house, which, of course means that everything that was new and shiny five years ago is decaying and in need of repair. Once freshly-varnished doors are cracking, door handles are sticking, long-life light bulbs suddenly blink off one after the other, the faucet for one of the bath tubs develops a leak, the washing machine pump is acting a bit cranky, a light over the stove develops an electrical problem, the scratches and dents on the wood floors look like a topo map. All of which explains why M has spent the last few evenings trying to fix the tub leak — learning more about plumbing than I think he cares to know — and which is why the wooden box that surrounds the tub has been opened up, which is how the mouse got into the bathroom in the first place. I saw her (him? let’s call her Squeaker and avoid a mis-assigned pronoun) yesterday morning, running around the edge of the tub, being pursued by Hudson. I made an attempt to catch Squeaker, but I wasn’t fast enough and my try only resulted in an even more frightened mouse, so I moved everything away from the tub and made sure the bathroom door was wide open so that Squeaker had a fair chance to escape. And then I left, figuring either the cats would do their work, or the mouse would find its way back out the way it had come in. This morning I heard noises in the tub, and found Oyster watching poor Squeaker try to scale the slippery sides of the tub. What did I do? I admit I left that cat and mouse in that tub and walked away. I had breakfasts and lunches to make, a goat to milk. Let the cat do his work. Why do I feed him and scoop his litter box anyway? Then, I got to remembering how another cat of ours, years ago, used to sadistically trap mice in another tub, and play with them for hours before finally killing the poor things and making an unholy mess in the tub. I didn’t want that death on my conscience. And I sure as heck didn’t want that mess to clean up in the middle of my day. So, Hyla and I staged a rescue. We gently lowered the little pink basket that used to hold bath toys over Squeaker. 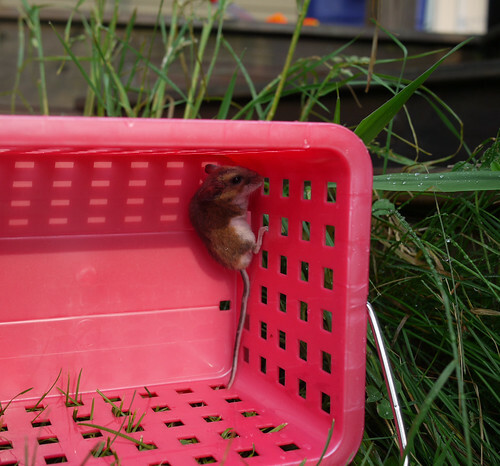 Then I climbed into the tub, slid a piece of cardboard under the “cage” and carried it outside. We turned the basket over on its side on the grass, expecting Squeaker to make a mad dash for freedom, but Squeaker just hung on to the side of the basket, utterly distrustful of us and our predator eyes. I just checked and the basket is empty now. I wonder how long it will be until Squeaker finds whatever hole she used before to enter the house, comes up through the walls into the bathroom, and we find her in the tub again. Frankly, the plumbing around that tub is kinda tricky and there are some tight places where we could use a pair of tiny hands.